Father, you helped Saint Francis to reflect the image of Christ through a life of poverty and humility. May we follow your Son by walking in the footsteps of Francis of Assisi, and by imitating his joyful love. Grant this through our Lord Jesus Christ, your Son, who lives and reigns with you and the Holy Spirit, one God, for ever and ever. Amen. Francis As the Model of Authentic Church Reform | Archbishop Charles J. Chaput O.F.M. Cap. 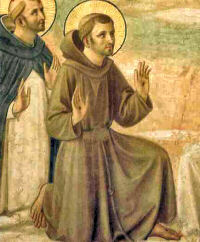 St. Francis (1182-1226) was born and died in Assisi. He was the son of a rich merchant, Bernardone, received a good education, and in the beginning followed the ways of the world. He was taken prisoner in the battle between the Assisians and Perugians, and after his release decided to abandon everything for Christ. His father became extremely displeased at his action, and disinherited him. In 1220 he founded a new order which in ten years numbered five thousand brothers. His followers were called Friars Minor because they were to consider themselves as the least among religious. Out of humility Francis never accepted the priesthood but remained a deacon all his life. He had a great love for God's creatures and called them his brothers and sisters. His ardent love of God merited for him the name of Seraphic. This feast is celebrated today both in the Ordinary Form and the Extraordinary Form of the Roman Rite. Francis Bernardone was born in 1181 at Assisi, Umbria, Italy. The son of a wealthy cloth merchant, he lived a lavish and irresponsible life. At the age of twenty, he went to war against Perugia, but was captured and imprisoned. During his imprisonment he experienced a vision from Christ and changed his life completely. He left all his possessions and embraced complete poverty, taking the Gospel as his rule of life. He wore ragged old clothes, begged for food and preached peace. He began to attract followers, and in 1209 with the papal blessing he founded the Friars Minor (Franciscans). Then in 1212 with St. Clare of Assisi he founded the foundation of the Order of "Poor Ladies," now known as the "Poor Clares." He also founded the "Third Order of Penance" (the Third Order) which included lay people. He was the first person (recorded) to receive the stigmata (the five wounds of Christ) in 1224. He died on October 4, 1226 at Portiuncula, Italy. He was canonized by Gregory IX less than two years later. Patron: against fire; animals; Catholic Action; dying alone; ecology; environment; families; fire; lacemakers; merchants; peace; zoos; Italy; Assisi, Italy; Colorado; Sante Fe, New Mexico; archdiocese of San Francisco, California; archdiocese of Denver, Colorado; archdiocese of Sante Fe, New Mexico; diocese of Salina, Kansas. Symbols: birds and animals; bag of gold and rich raiment at his feet; winged crucifix with five rays; stigmata; crown of thorns; lighted lamp; fiery chariot; birds; deer; fish; skull; wolf; fire. Pray the Canticle of the Sun, which was written by St. Francis. For more reading, see the selections from the Catholic Culture Library. This page from the Franciscan Archives contains links about St. Francis of Assisi, including biographies, articles, writings, Orders & Societies, liturgical texts and art. Many parishes have a Blessing of animals or pets on this day. See the Prayers column for other alternatives. St. Francis loved all of God's creatures. Find the stories of the Wolf of Gubbio, the Sermon to the Birds, his Canticle of Creatures to see some illustrations of his honoring God's creation. St. Francis was influential on our present-day Christmas crib or creche. Find out more about this historical event. See the articles in our Activities top bar. Although St. Francis is one of the most popular saints of the Church, and his feast is a huge celebration in Assisi, there are no particular foods attached to that festival. Tradition has passed on that on his deathbed he requested Frangipane cream or Moastaccioli (almond biscotti). Fire is a symbol of St. Francis, first of all because his heart was on fire with love of God, but there are other stories in Little Flowers of St. Francis that deal with fire, particularly when he prayed, the surrounding areas would become so bright that people thought the areas were on fire. So a flaming dessert or wine would be an appropriate ending of a wonderful feast. One could also try some Umbrian style recipes, or just have "Italian night" at home, even just simple spaghetti or other pasta and sauces. Learn more about the Franciscan order. The Catholic Encyclopedia has a wonderful entry on St. Francis, including his Rule. And from the Catholic Culture Library you can read a detailed summary of the life of St. Francis and his founding of the Order of Friars Minor. What does poverty in our state of life mean? How can I follow the Gospels like Francis? Learn more about geography and history of the Umbria area, and how much Francis has impacted that area. Study art and photos of Francis. Find out more about the Basilica of St. Francis in Assisi. Although the earthquake in 1997 damaged the basilica, it reopened in 1999. Go here for Saint Francis of Assisi, The Writings of Saint Francis of Assisi, translated by Fr. Paschal Robinson in 1906. "My little sisters the birds, ye owe much to God, your Creator, and ye ought to sing his praise at all times and in all places, because he has given you liberty to fly about into all places; and though ye neither spin nor sew, he has given you a twofold and a threefold clothing for yourselves and for your offspring. Two of all your species he sent into the Ark with Noah that you might not be lost to the world; besides which, he feeds you, though ye neither sow nor reap. He has given you fountains and rivers to quench your thirst, mountains and valleys in which to take refuge, and trees in which to build your nests; so that your Creator loves you much, having thus favoured you with such bounties. Beware, my little sisters, of the sin of ingratitude, and study always to give praise to God."